Last summer, I wrote a post comparing my experiences at SoulCycle and Pure Barre. And recently, I tested out OrangeTheory for the first time. Originally, my plan was to make a mega-post that compared all three of these “cult favorite” workout classes, but it feels odd to re-use old content, and, considering I haven’t been to a SoulCycle or a Pure Barre class recently, I feel like I can’t really add any new information beyond what I already talked about in my earlier post. 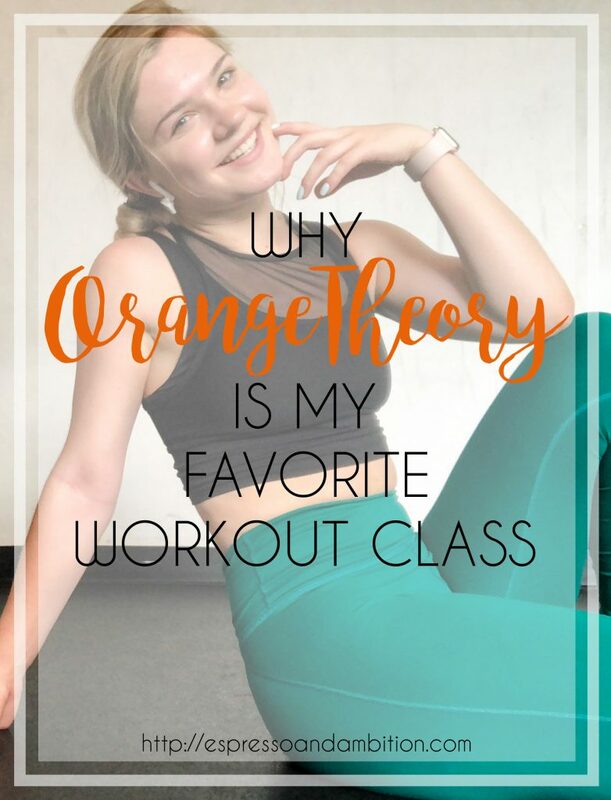 I can, however, talk about why OrangeTheory was my favorite of the three. OrangeTheory is based on this concept of excess post-exercise oxygen consumption (EPOC), which means… exactly what it sounds like. When you get your heart rate up and keep it at that elevated rate, your body naturally uses more oxygen – even after the workout has ended. As a result, your metabolic rate stays elevated throughout the day. Keeping your heart rate in that 75-85% of your max (the orange zone) for a certain period of time should, theoretically, allow you to continue to burn calories at a higher rate – hence the name, OrangeTheory. This isn’t so much a reason I personally love it, but more of a reason why I think it’s great in general. Most of the class can be adjusted based on personal level of fitness, instead of the more one-size-fits-all methods of a lot of other workout programs. On the treadmills, you can be the person who power-walks the whole time, or you can be the person who’s maxing out the speed during the “all-out” segments. You can use super-heavy weights during floor work or you can use 5-pound dumbbells. It’s all a matter of what your body can do. For that reason, I think it’s fantastic for people who are just getting into fitness and want a controlled environment where they can ease into it gradually. There’s just something about seeing your stats reflected back at you throughout the workout that makes you want to push harder. Or… maybe I’m just extremely competitive (yes, even with myself). But if you’re like me in that regard, you’ll definitely get a kick out of watching your numbers throughout the workout and forcing yourself into that extra little push to get into that orange zone. I really love the way the OrangeTheory plans are packaged. Basically, you can purchase a given number of classes per month. During the month I was using it, I had the 8 classes per month plan, which meant that I was going to OrangeTheory twice a week, leaving me four other training days and a rest day. (As a side note: a six-day-a-week training schedule is what I like, but honestly, it’s definitely not a necessity for good fitness levels.) Other plans – like unlimited classes per month – make it hard to combine with an existing training program (at least for me), because I feel guilty for not making the most of the “unlimited” aspect. Workout classes definitely aren’t the only way to achieve your fitness goals (I mean, I’m not currently doing any classes and I’m doing just fine), but they sure are a fun one. If you have a favorite workout class, let me know in the comments!